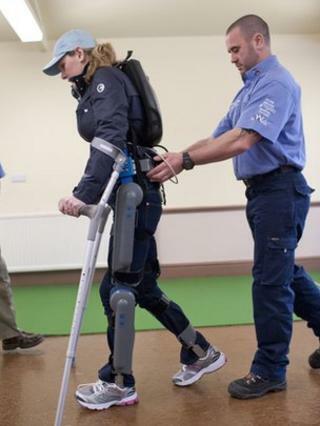 Six years ago, professional horse-rider Claire Lomas was told that she would never walk again but now she is attempting to walk more than 26 miles (42km) at Sunday's London Marathon thanks to a pair of "robot legs", which have transformed her life. When Claire was told she would spend the rest of her life in a wheelchair after a spinal injury, she wanted to get back on her feet as quickly as possible and regain her independence. For the past three months she has been training intensively for the marathon using a robotic walking suit to prove she is just as determined as in her sporting days. When Claire sets out with participants on Sunday she knows that most will aim to finish in hours. For her, it will take about three weeks. A former event-rider who had competed at the highest level, Claire thought that the Burghley Horse trials, a four-star horse-riding event for top-class riders in Stamford, Lincolnshire, would be her greatest test. "I didn't think I'd ever get to that level. But the marathon is a bigger challenge. I was wrong." In the beginning she could only take two steps. Just a few weeks ago, she could only walk 30, making the marathon a near impossible feat. But Claire's sporting background has provided her with the resilience she needs to keep going. Following gruelling training sessions three times a week at a Yorkshire clinic, she can now cover longer distances of up to a mile in one session. It takes at least two-and-a-half hours for her to complete a mile but she hopes to improve her speed as the weeks pass, staying in a hotel at night-time and starting afresh every morning from the point where she left off the night before. In 2006, Claire's horse Rolled Oats clipped his shoulder, flinging her from the saddle into a nearby tree. The fall broke her neck, back and ribs and left her paralysed from the chest down. Claire first saw the "robot legs", or ReWalk bionic walking device, while researching her condition on the internet. She jokingly likens the device to Wallace and Gromit's "wrong trousers", and with the help of her friends and family raised the £43,000 necessary to get them. But walking in "techno trousers" is not as quite as easy as in the Nick Park animation - while the "wrong trousers" walk on their own, Claire's require patience, perseverance and intense effort. She says: "Not feeling my body makes it so hard. I don't know what my feet are doing." Claire relies on motion sensors to help her move and lift her legs and one of the most difficult things for her has been simply learning to stand on two feet again. "To start with I just had to find my balance without wobbling." The London marathon is not the only race Claire is competing in, as she and her one-year-old daughter, Maisie, are battling it out to see who will be the first to walk unaided. Matthew Loddy, 46, from Hertfordshire, is completing 100 marathons in 100 days for teenage cancer charity Framework Foundation. The final leg of his journey is the London marathon. Lance Bombardier Rob Long, 24, who was blinded in Afghanistan, is running the London marathon in aid of Blind Veterans UK. BBC newsreader Sophie Raworth, chef Gordon Ramsay, cage fighter Alex Reid and model Nell McAndrew are among the celebrities racing for charity. "We've had this competition all along so we'll see. She can do 10 steps on her own now. I'm as wobbly as her." Claire hopes to raise more than £50,000 for Spinal Research, a charity which funds medical research to develop treatments for paralysis. Former rugby player Matt Hampson, who was paralysed after a rugby accident, will provide moral support for part of her marathon journey, as will retired tennis player Tim Henman and former champion British equestrian Lucinda Green. "There's a lot of people who are worse off than me and haven't got the support I've got, so I want to raise as much as I can." But, when the marathon is over, Claire thinks that for the first time in six years, she will be delighted to return to her wheelchair.